This recipe is a signature dish at Vij’s, and he gladly shared it for my At Your Request feature of Pacific Palate. This dish will make 16 large size or 20 medium size popsicles. 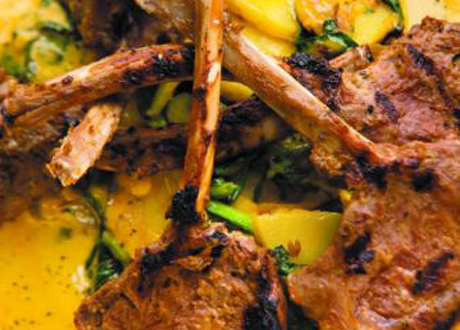 Cut the racks of lamb into the ‘popsicles’ by slicing the chops in between the bones. Mix the white wine, mustard and salt together in a large bowl, then add the popsicles, turning to coat them on all sides. Cover and set aside in the refrigerator for a couple of hours. In a separate bowl, mix together the whipping cream, salt, paprika, cayenne, fenugreek flakes and lemon juice. In a medium-sized, heavy pot sauté the crushed garlic in the canola oil. Once the garlic is golden in colour, add the turmeric, stir and heat for one minute. Add the whipping cream mixture, stir and heat on low to medium heat for a few minutes (the water in the whipping cream will evaporate, thickening the sauce. If your heat is too high, the cream will separate.) If making the sauce a day ahead, let the garlic mixture cool completely then add to the cream mixture and refrigerate. Thicken the sauce close to serving time by heating gently.